Clear blue seas, warm sunshine and excellent diving make a Dive Asia day trip a great choice for a day in the tropics. We've designed our itinerary and timetable to allow you access to Phuket's best local dive sites. With 2 or 3 dive options,you chose the trip best suited for you. And our special trips to the islands of Phi Phi and Raja Noi and Raja Yai will astound you with breathtaking scenery both above and below the sea. The M/V Dive Asia II offers a safe and comfortable dive base for your day diving. She has a spacious lounge, large covered/open sundecks, a comfortable dining area where you will enjoy Thai/International meals, and a well-designed dive platform for easy water entry and exit. Your safety and enjoyment is our guarantee! Our highly trained professional dive staff is committed to providing the highest level of service and standards of reliability on all of our day trips. Please check the dates and prices of our scheduled trips to plan your diving holiday. 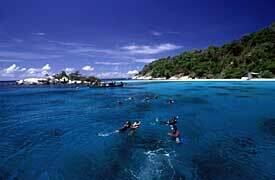 Details of the diving destinations will assist you in making your selection. Once you have chosen the trip to suit you, please use our online form to make your booking or for any further inquiries you may have.